Cut-Out features often appeared simultaneously across several of IPC’s humour titles, with in-house ads publicising the commencement of, for example, January 1978’s Spotter Books promotion running in Krazy, Whoopee! 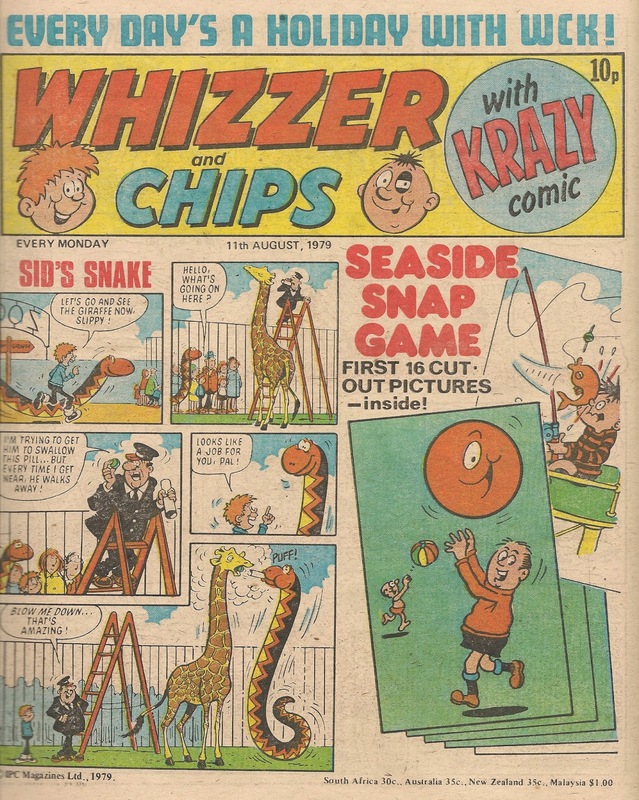 and Whizzer and Chips as well as the toothy funster’s comic or, a year later, the concurrent appearance of calendar, diary and snap game in Whoopee!, Whizzer and Chips with Krazy, and Cheeky Weekly respectively (Krazy had been subsumed into Whizzer and Chips as of April 1978). Buster, the venerable humour title from IPC’s line, often exempted itself from these promotions as for some reason, unlike its counterparts, it didn’t feature internal colour pages (one promotion in which Buster did take part was 1978’s Mini-Comic marketing scheme, but due to the lack of colour inside the comic, the teeny version of Cheeky Weekly which appeared in that title was entirely monochrome). 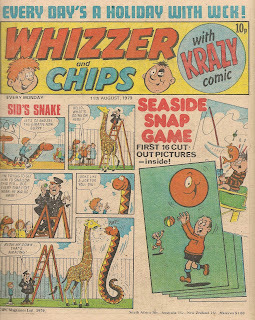 Curiously, the Giant Cheeky poster commenced a week after the Seaside Snap Game began in Whizzer and Chips With Krazy Comic. Quite why the two promotions weren’t synchronised is a bit of a puzzle. 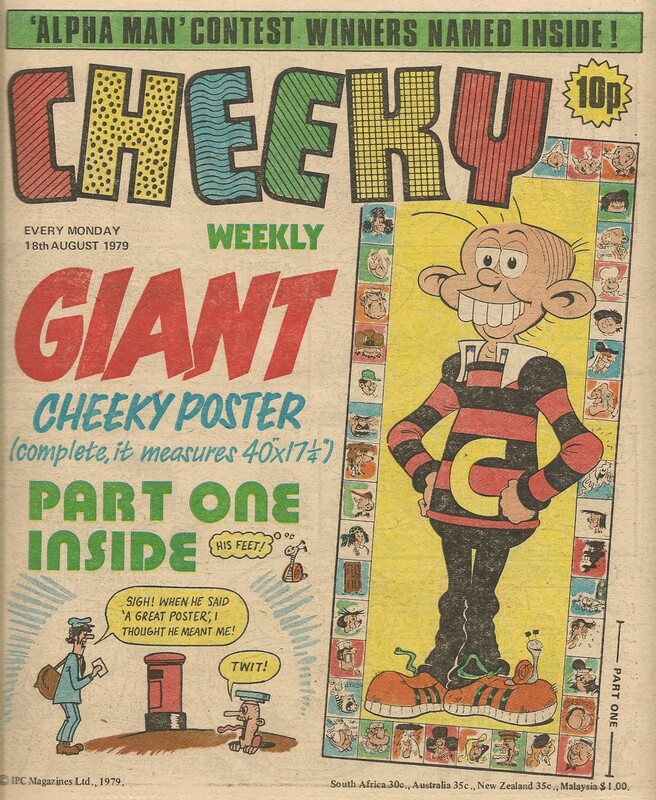 In Cheeky Weekly dated 11 August 1979 Disaster Des and Calculator Kid occupied the centre pages and earlier in the comic there was a 2-page Joke-Box Jury which surely could have been jettisoned to accommodate the poster. Buster didn’t present any cut-outs in the same period but that’s no surprise. 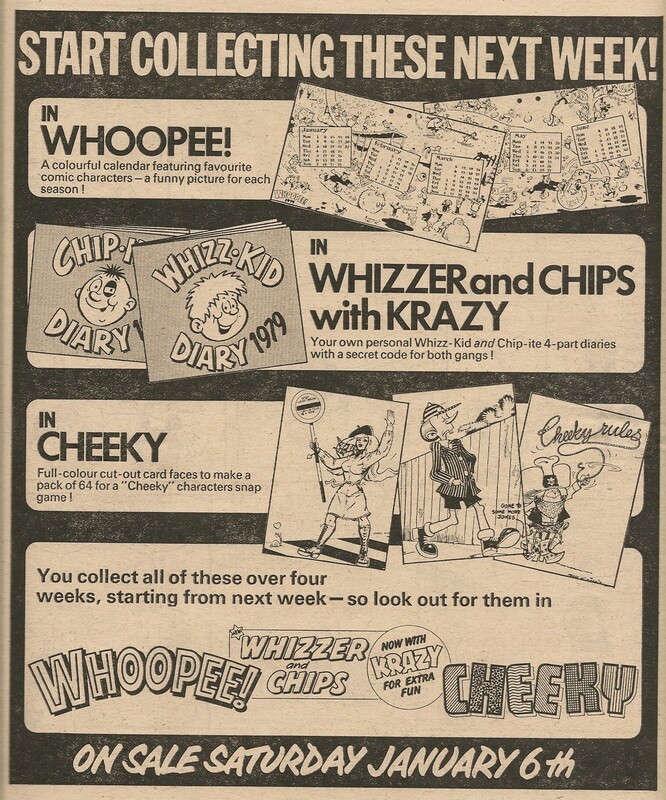 I don’t know whether a cut-out feature commenced in the 11 August 1979 Whoopee!, but if it did there were no adverts for it in Whizzer and Chips or Cheeky Weekly. 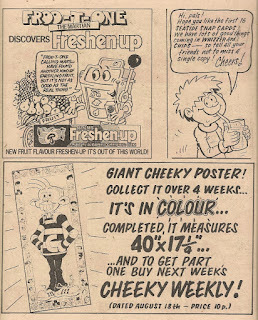 The canny Cheeky Weekly editor presented the four instalments of the Giant Cheeky Poster in ascending order from the toothy funster’s feet upwards, forcing readers to buy all four comics in order to obtain a full-length pic of our grinning pal, although fans of Snail were pleased to see the mirthful mollusc appear in the first week. The borders around the poster were comprised of small pictures of 44 members of the Cheeky’s Week supporting cast, all of which appear to have been specially drawn for the poster by Frank McDiarmid. 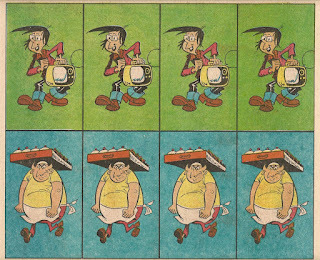 Whoever applied the colours allocated the wrong skin tone to Disco Kid, and some of the colouring surrounding the border characters in the actual poster differed from that shown on the cover of Cheeky Weekly dated 18 August 1979. A vast improvement on the earlier, dismal Top Ten Poster, this colourful offering undoubtedly adorned the bedroom wall of many a Friend of Cheeky. Not to be confused with Pin-Up Pal posters. It’s always seemed to me that, in general, page 31 of IPC’s 32-page comics during the 70s was the least-favoured spot in any issue. 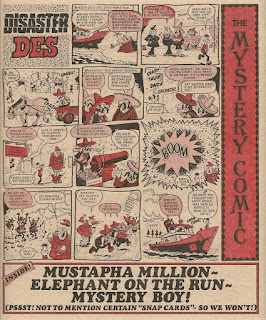 The back cover was of course a prime location, being one of the limited number of pages in each issue that would feature colour printing (except in the case of Buster which, for some reason, was more parsimonious in its use of colour than its companion titles, limiting multi-hued artwork to its front page only), and it also had the responsibility of bringing the comic to a satisfying conclusion so I presume some thought was given to which strip would best suit the benefits and responsibilities of such a key spot (except on the occasions on which the back cover was the site of an advert, of course). 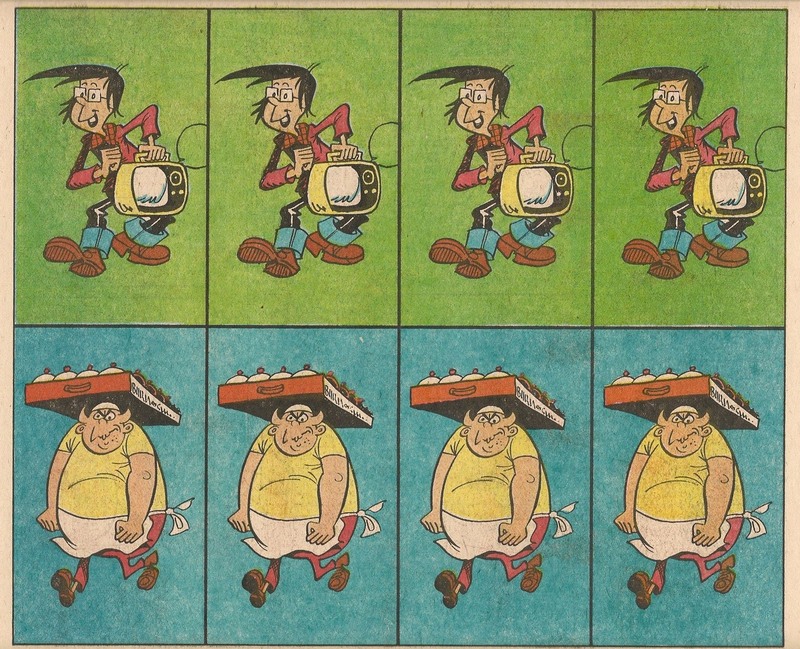 I’ve always viewed the placement of strips as indicative of their popularity, and assume that the most successful features were allocated slots towards the front of the comic or in the colour-bearing centre or back pages, with the remaining locations hosting features placed in descending order of reader appreciation. Thus, in my (quite possibly erroneous) view of the rules of element distribution, whatever content occupied page 31 in most titles tended toward filler material or second-string adverts. However, the situation pertaining to Cheeky Weekly was somewhat different. Each issue chronicled a week in our toothy pal’s gag-filled life, starting on Sunday and concluding the following Saturday. Since these seven pun-packed daily episodes were interspersed between the other features comprising each issue, initially acting as framing devices for the other strips, my assumption clearly cannot be applied to the Cheeky’s Week elements of the comic, nor the ‘framed’ strips and the strips contained within the Mystery Comic section, since they were all tied to a particular location, although I’d argue that my theory still holds true in respect of the non-Cheeky material in the issues published after the framing and Mystery Comic devices were abandoned. 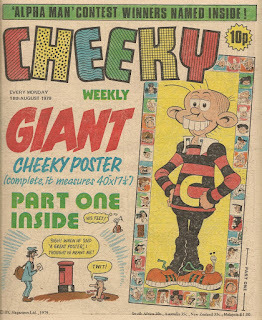 Cheeky’s Saturday visits to the cinema dictated what would be printed on page 31 until the final Saturday morning pictures sequence was printed in the 02 December 1978 issue. Thus sci-fi cinema serial Space Family Robinson occupied the page under review in Cheeky Weekly’s debut edition, but the following week the placement of the picture show elements was disrupted somewhat by the debut of cartoon elements Bam Splat and Blooie and Cocky Doodle, plus the inclusion, as Guy Fawkes night approached, of the appearance on the back cover by an ad for Standard Fireworks, making the most of the colour printing to emulate the effects of their incandescent products. 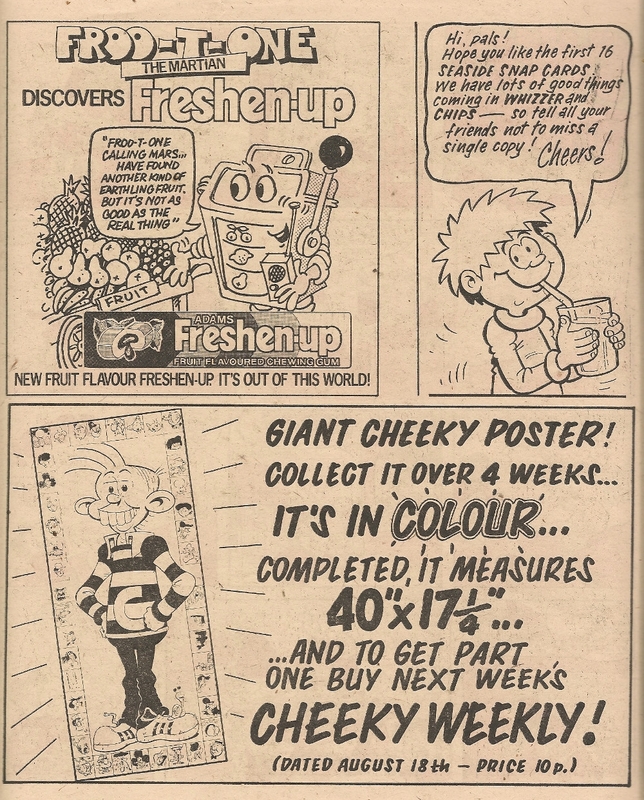 Thus Cheeky’s emergence from the cinema occupied page 31 that week, but for the following four weeks the subject page was host to the cut-out Skateboard booklet, an item again benefitting from the colour printing available overleaf on the back page. The conclusion of the Skateboard booklet was immediately followed by another 4-week cut out scheme involving page 31, this time presenting readers with a diary in which to record their doings during 1978. The intergalactic thrills of Space Family Robinson then returned for a single week, following whch yet more snip-out-and-save activity landed on page 31 as the Cheeky Spotter Book of Fun commenced its 4-week occupancy. 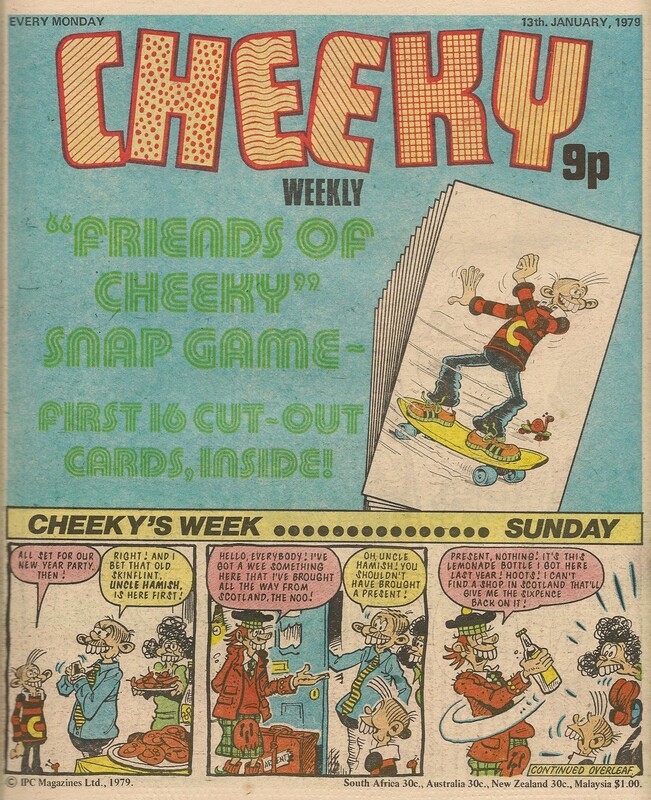 The 04 February 1978 issue was the skateboard special, and that week the location under review was home to Cheeky’s Saturday exit from the cinema, together with a photo of a chimp on a skateboard – the epitome of a filler. The concluding portion of Saturday turned up again the following week, but in the next issue page 31 contained 2 in-house ads; one for Misty issue 3 which that week featured a Wheel of Fortune Wallet free gift, and the other for Buster which was also handing out freebies in the form of Corona stickers relating to the soft drink manufacturer's 'Every bubble's passed its Fizzical' ad campaign. Saturday and the slapstick antics of Bam Splat and Blooie then shared the page, after which Saturday found itself alongside some stamp-collecting ads (please tell your parents) and the announcement of the forthcoming competition to win a copy of Basil Brush's most recent vinyl release, Boom! Boom! It's the eponymous, bushy-tailed, Ivan Owen-operated humorous puppet. That IPC failed to issue an LP record featuring songs and japes performed by Cheeky and pals is of course something with which all true Friends of Cheeky have ever since failed to come to terms. As mentioned above, the 30 September 1978 issue was the last to include the Saturday morning pictures sequence (although Saturday continued as a 2-page per week feature, thereafter focusing on the toothy funster’s Saturday afternoon pursuits), and in that issue Tweety and Sylvester’s antagonistic escapade occupied page 31. 7 days later The Terrible Trail to Taggart's Treasure began an 8 week run (making the piratical peregrinations of the Mason clan the third most regular subject on page 31), following which truncation of the subsequent 2 issues due to industrial action meant there was no page 31. 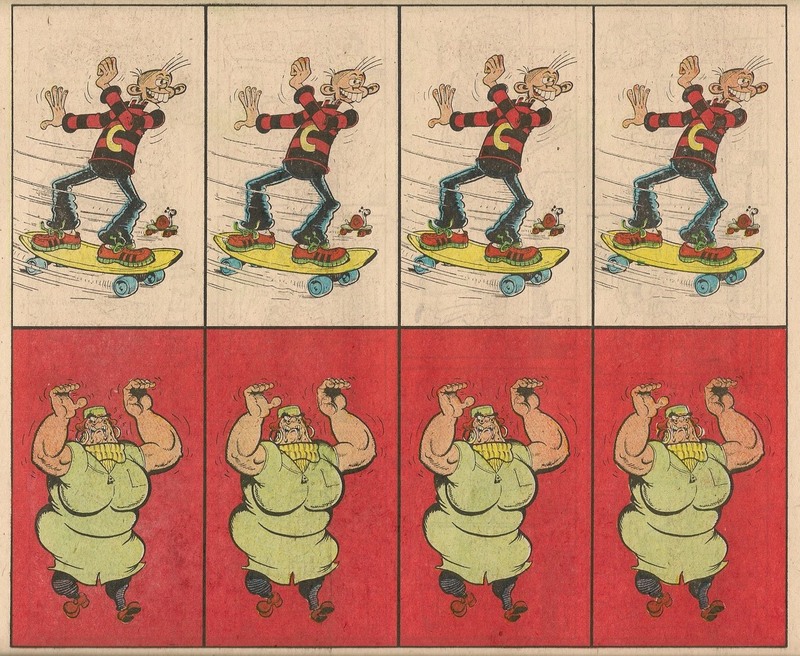 The comic then failed to be published for 3 weeks as the industrial problems escalated. When the comic resumed publication with the issue dated 06 January 1979, page 31 was once again the home to Saturday, and that continued to be that case for a further 12 weeks. The 07 April 1979 edition saw page 31 host the assembly instructions for the Top Ten Poster, part 1 of which was contained in that issue. Saturday then resumed for the remaining 43 issues of the comic’s run, bringing the total times that Saturday occupied the location in question to 88, making it the most regular occupant of the site. The second most frequent inhabitants of the subject location were half-page, in-house ads for IPC product, which appeared there in 20 issues. I’m not quite sure why IPC adopted a synchronised approach to this kind of promotion. Surely if these marketing campaigns were applied to one comic at a time there would be more chance of that title picking up a few new readers, whereas I would have thought it unlikely that kids (or their parents) would shell out for 3 comics in addition to the one they already followed. Or maybe IPC’s research showed a significant proportion of their target market already subscribed to more than one title. Or possibly they felt that disgruntled readers, annoyed at losing some of their favourite features in order to accommodate the snip-and-save pages, would be less likely to jump ship to another title for the duration of the promotion since they would be aware that the companion comics were similarly afflicted. 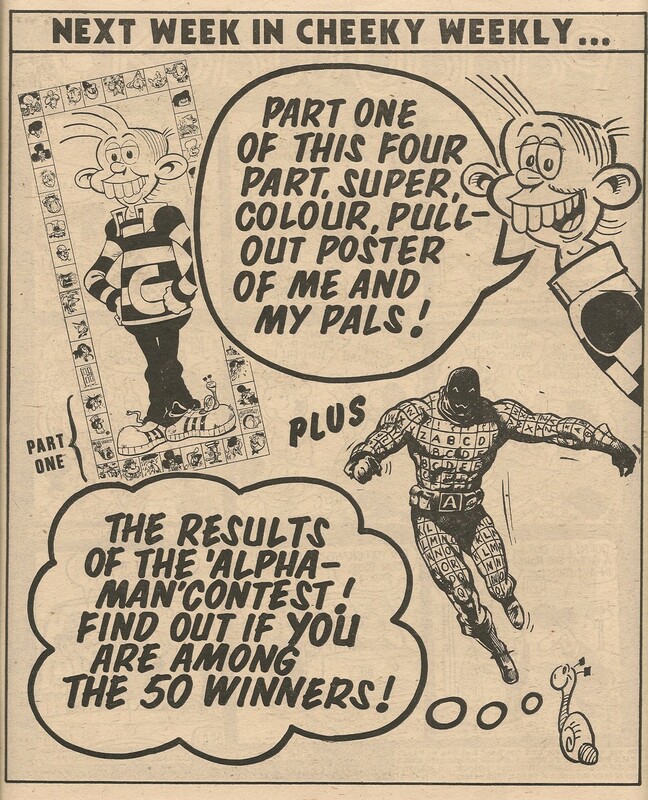 However, there was the threat that readers would move across the great divide to DC Thomson's titles which, as far as I'm aware, did not include cut-out schemes. 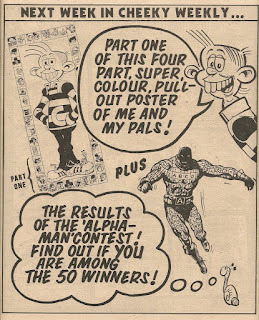 As was often the case, Buster exempted itself from this promotion due to its lack of internal colour pages at the time. Friends of Cheeky is a phrase that harks back to issue 2 of the toothy funster’s comic, but rather than referring to readers of Cheeky Weekly as it originally did, the friends alluded to in the name of this game were Cheeky’s pals, 15 of whom appeared, along with the toothy funster himself, on the ‘cards’ which were presented in the centre pages over a four week period. 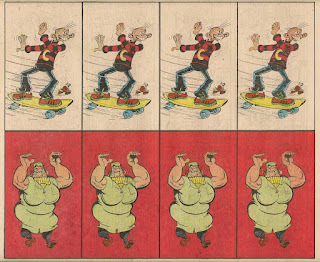 10 of the images shown on the cards were taken from the Pin-Up Pal poster series which had been running since the comic’s first issue. Although Ursula, Jogging Jeremy and Louise had previously featured on Pin-Up Pal posters, their likenesses on the cards were sourced from elsewhere in the comic. The cards featuring Baker’s Boy, Dan-Dan the Lavender Man and Square-Eyes also re-used images that had originally appeared on the Cheeky’s Week pages, and were later used as Pin-Up Pal posters (see table below for details). 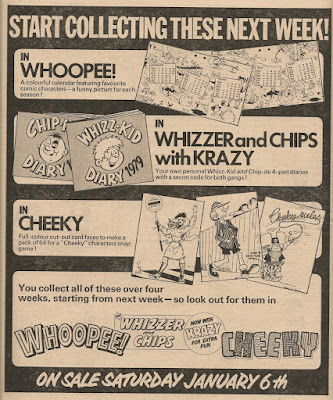 Cheeky Weekly 13 January 1979 - Cheeky makes no mention of the cards within that week's issue of the Mystery Comic, nor did he in any of the subsequent three issues. in week two of the snap game. for the first 2 weeks of the promotion. The instructions for playing the game (for the benefit of those who had presumably never enjoyed a round of the at times rumbustious Snap and/or weren't buying Cheeky Weekly a year earlier) were printed on page 24 well away from the centre pages, in the issue dated 03 February 1979, which contained the final set of cards. ...and Not to be confused with Silly Snaps, which appeared in the latter 3 editions listed above.